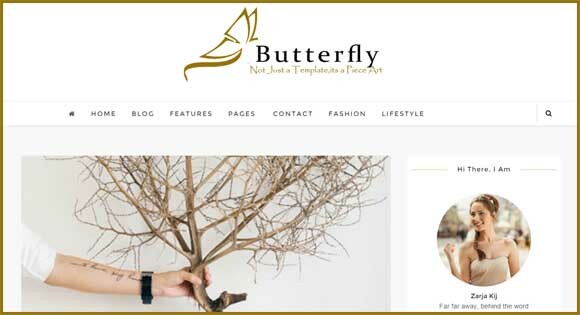 ButterFly Blogger Templates didesign untuk wanita feminim. Dengan sticky navigasi menu dan Photo profil penulis blog disebelah kanan. Dibawah juga tersedia panel untuk terhubung dengan akun instagram Anda. You can integrate your instagram with this template. Page Navigation Menu, Personal Pages, Girly, Simple, Email Subscription Widget Ready, Technology, Fashion, White, 1 Sidebar, 1 Right Sidebar, Clean, Minimalist, Seo Ready, Magazine, Free Premium, Post Thumbnails, Responsive, Social Bookmark Ready, Drop Down Menu, 2 Columns.